Elland Cricket Club has some extensive facilities that our members use throughout the year that will be available for you to provide you with the greatest comfort throughout your stay here. We have male and female changing and bathing facilities thanks to our cricket and football teams. For the duration of the event, there will be 24 hour round-the-clock security so you can be confident to leave the site and visit some of the other landmarks and features around this wonderful county. There are two large bars which will be open for the duration of the weekend. There will also be several large indoor TV screens that will allow you to watch all of the first two stages of the tour whatever the weather. Secure parking facilities will be available although, unless you book for a caravan plot, you will not necessarily be able to park your vehicle directly next to your pitch. The Clubhouse - has several large viewing screens which will closely follow the Tour de France's pelaton for the first two stages It also boasts a large bar where drinks (and light refreshments) will be available. It also has two pool tables and fruit machines. 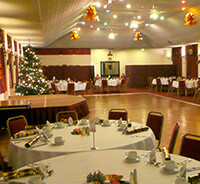 The Baines Hall Function Suite - will be open for the duration of the event. This purpose built facility has and extensive bar and can hold over 300 people. It is in this room where at least one large TV screen will be freely available for your viewing pleasure and will exclusively cover the two first stages of the Grand Depart.